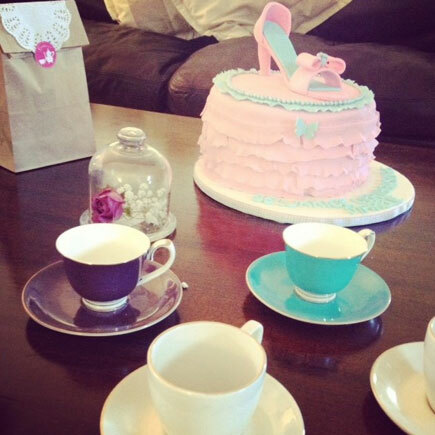 We host amazing High Tea Parties for Little Ladies, Top Chef Pizza Parties where children make their own pizzas from scratch. 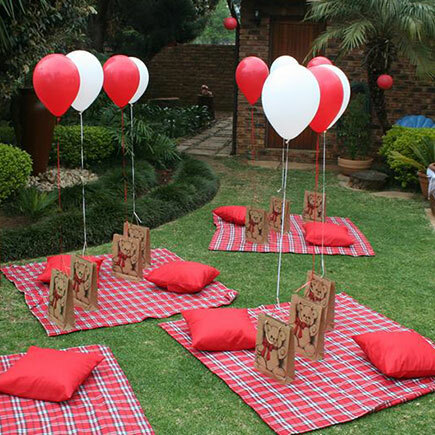 Master Class Party’s where your child gets to be the Master Chef for the day as well as delightful Teddy Bears Picnic where guests bring along their favourite teddy bears and enjoy a special picnic! 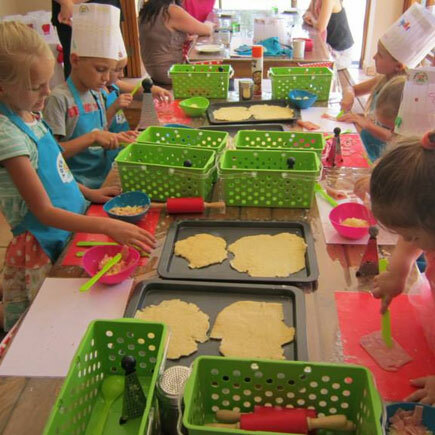 We offer weekly classes as well as school programs, baking play dates and one-on-one sessions with an aim to give children a solid grounding in cookery, allowing them to develop their knowledge and discover a passion for food as well as the satisfaction in creating a great meal. Need to keep the kids busy during the holidays? We offer fantastic holiday clubs nationwide all year round. 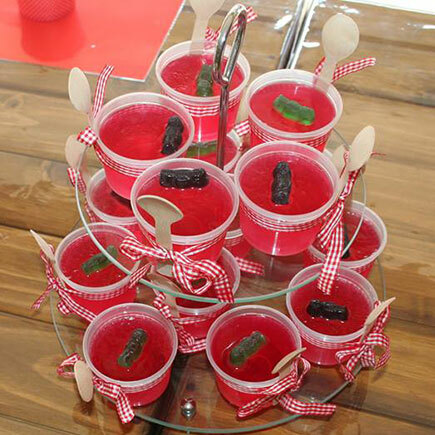 Our holiday clubs include crafting and baking workshops and are themed around specific holidays. Please contact a branch near you for more information. The kitchen is the very heart of family life, it's where many of life's lessons are learned. Cooking and baking provide the perfect combination of fun and creativity, and it's a great way to teach children about the food they eat. 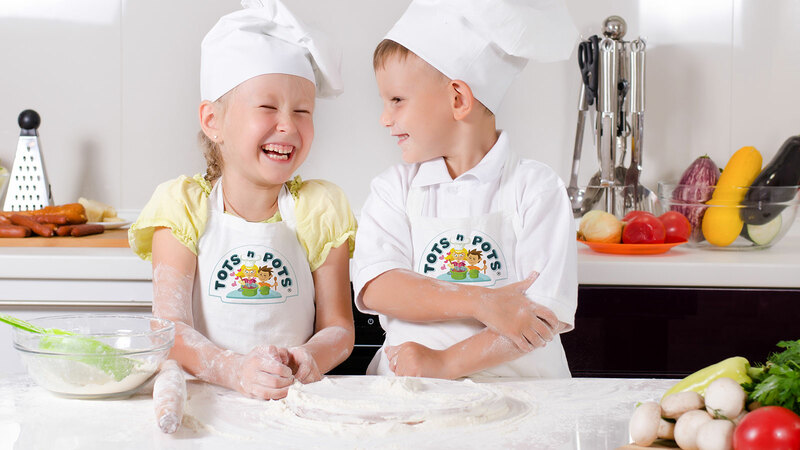 Tots n' Pots offers fun, hands on workshop dedicated to providing Moms, Dads or Granny's some valuable time with their child as well as the opportunity to create memorable moments. The workshops allow your child to be creative whilst having fun… and the best part… you can leave the mess to us! Have you ever dreamed of owning your own buisness, being your own boss and having a flexible lifestyle? Tots n Pots might be the answer for you! Tots n Pots is A business that allows you to have quality time with your children but still be able to earn a living working from home. 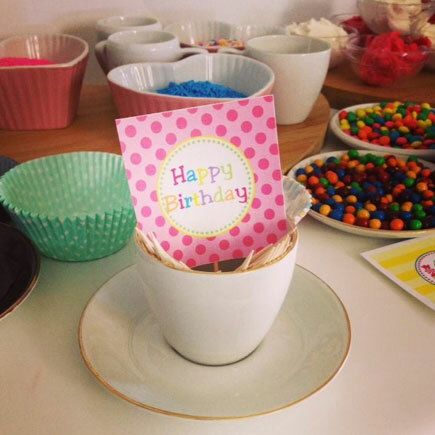 Should you not wish to offer the full franchising package, such as school classes, home classes and holiday programmes but are looking for a part-time party business hosting our stunning parties, please contact shaaista@totsnpots.com for more details. You will be part of an established brand name and network. By becoming a franchisee you are in the business for yourself not by yourself. 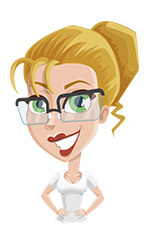 You are gaining the benefit of our experience and knowledge thereby reducing the scope of making mistakes. In particular you will be spared the many administrative headaches and costs associated with setting up a business from scratch. 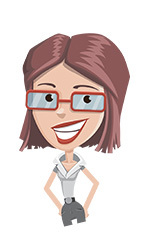 You can benefit from activities in areas such as advertising, marketing research and brand development. You will receive on going training and support to help you through any problems you may encounter as well as valuable support and advise from our in- house nutritionist. 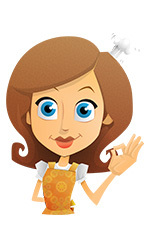 You don't need previous experience, just a love of children and cooking! You will be working for your own future, not somebody else's. 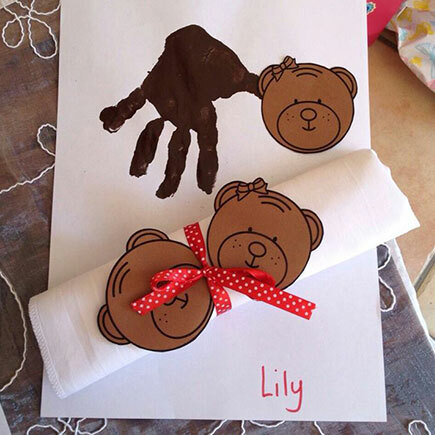 At Tots n Pots we offer lovely themed holiday workshops nationwide. 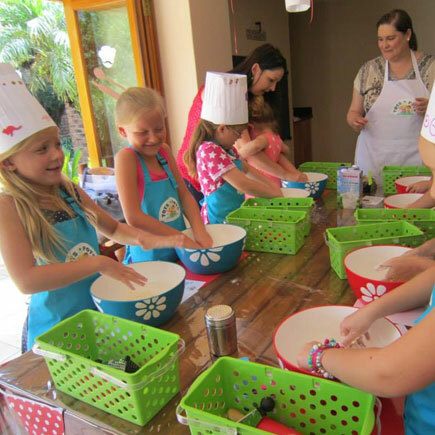 Each workshop is created to keep children busy and stimulated during the long holidays, we offer baking/food prep and creative time. We also offer once off special themed days too, such as Mother’s Day, Daddy’s and Daughters Day, Valentine’s Day and much more! 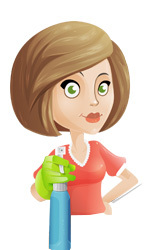 Please keep an eye on our facebook page for regular updates. Please contact your nearest branch for more details. 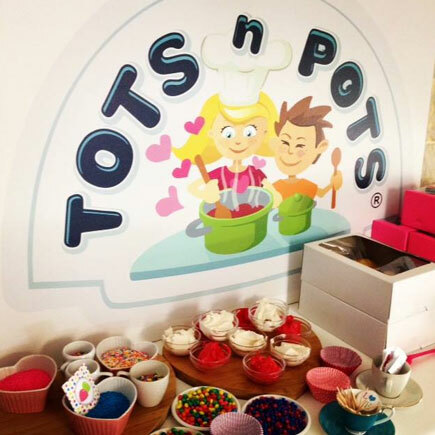 If you would like Tots n Pots to come to your school during the holidays, please contact us for more info. Here we focus on fine motor skill development on a every level. 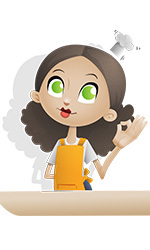 Children work alongside their Moms or caregivers experimenting with new tastes and textures. By the age of 2, children develop a strong opinion about what they do and don’t like. Mothers’ often become frustrated as their ‘super non-funny baby’ suddenly develops a strong sense of will and decides he no longer enjoys the foods he used to love. It can be soul destroying! Our aim is to combat and get them back on the right track. The class is very much focused on fine motor skill development and tactile defensiveness. Children are encouraged to enjoy messy play time in a fun and relaxed environment and it is of the utmost importance that children are not restricted in this class. This is the only way they learn not to become fussy eaters through repetition and experimentation. Children are encouraged to touch, taste and feel new shapes and textures. A slightly more advanced class than sticky fingers. Children will learn about new shapes, the feeling of different textures, colours & tastes through our fun baking workshops. They will feel a big sense of achievement when the see their very own creations! They will even be able to decorate and personalise their own take home boxes. Again, focus on a theme such as a holiday or season, make it fun by having a dress up for a special themed class and remember to take lots of pictures. Children of this age can start to learn how to follow a set of instructions read from our chalk/white board and be able to measure out ingredients using tsp/ cups etc. We introduce slightly more complex recipes, with more ingredients and steps. Class time 60mins. 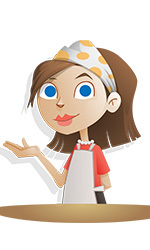 This programme is designed for 8 year old plus who will learn how to cook simple but nutritious meals all by themselves! They will follow their own recipes which are more complex and graduate to the weighing scales for measuring., Children work in teams of two or three to create a dish of their own. Children enjoy making recipes such as omelettes, pancakes, tortillas/quesidallas, savory crepes, stir fries, fish cakes and potato cakes! 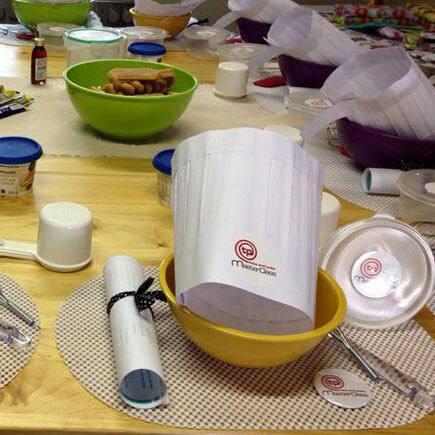 Children enjoy decorating their very own chef’s hat and receiving their own recipe books. Please note that Moms do not need to accompany their children for this programme. Class time 80mins. Each of our classes has a special ingredient of the day, where children learn about a new ingredient each week, where it comes from, nutritional values and experiencing examples. 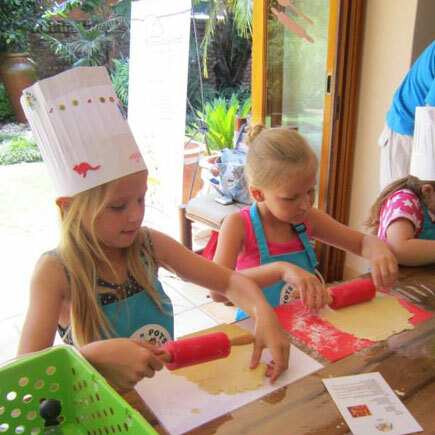 During our Master Class party Your child gets to be the Master Chef for the day along with his/her sous chefs. All of this, while creating their very own masterpiece to take home. 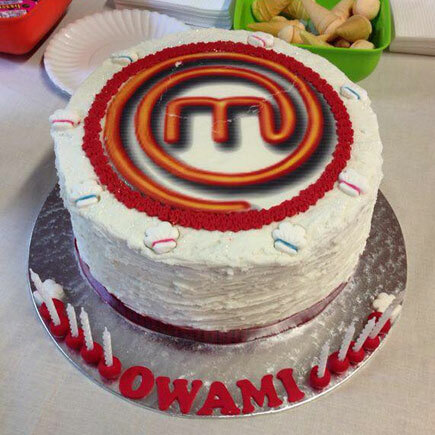 Children are split up into teams presented with immunity badges & mystery recipes and judged on their creations! 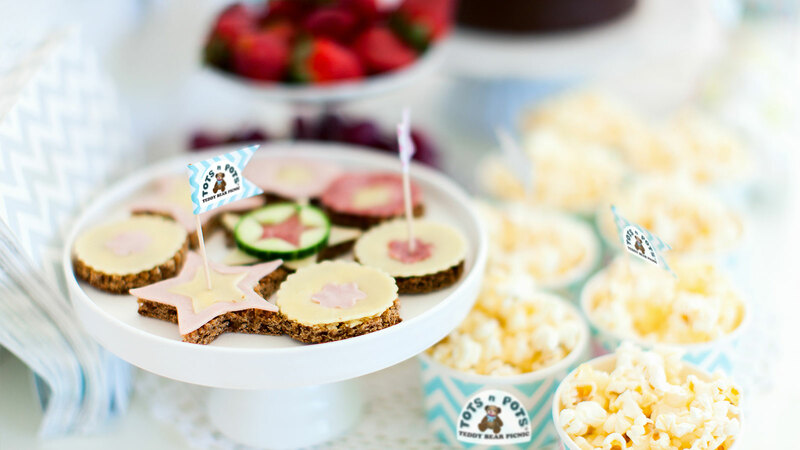 Allow your child to enjoy a no fuss party that will be a party to remember! 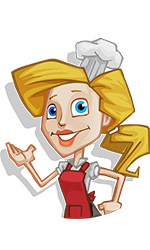 During our Top Chef Pizza Parties kiddies get to make their very own pizzas from scratch. Followed by creating their own pizza cookie masterpieces! Children chose toppings from our special pizza topping stations & enjoy being head chef for the day! For more information, class structure and booking forms, please contact one of the Tots n Pots owners who are closest to you. Alternatively you can complete our online enquiry form and a Tots n Pots representative will get back to you as soon as possible.